Sean speaks to The Wild Bohemian that is musician Malcolm Hill. They speak of War and Peace, VHS tapes and Demis Roussos, among other things. Strap yourself in. Sean starts the show with a poem called If We Could Have Flown. This poem was originally commissioned for Dear Everybody Collective curated by Melody Paloma. Sean was asked to write a series of poems in response to works by video artist WWZARD6. Sean and Malcolm have a chat about the launch of his new single 'Cosmic Love'. Then Malcolm performs a very special cover of this classic 1973 banger in response to a creative prompt supplied by Rowan White. His prompt was "Demis Roussos not only predicted #auspol 's 2018 climate & energy debates with his 1973 hit 'my friend the wind', he resolved them. Discuss." We didn't exactly do that but it did prompt some discussion about the eternal smiles that Demis inspires. And then Malcolm reads a piece especially written for the show inspired by a prompt from Meena Shamaly - "A poem constructed from the titles of books published in 1865. (Or any specific year of your choosing)." Malcolm explores this prompt by reading a piece inspired by War and Peace, published in 1865. Sean also remembers the art of book spine poetry. Sean answers the More Than a Whelan challenge with a poem written in response to four prompts posted on the MTAW Facebook page by Rose, Lisa, Kadtie and Sean himself! Malcolm accompanies Sean with some improvised strumming. Prompt 1 by Rose: Artificial tv set light is currently shining in my eyes. Hiding in the corner - crew life. I am working but inside my head I am learning lyrics, running through my to do list...juggling my next 5 days of multitasking. I also just made an 11.11am wish with the lady from wardrobe. I'm not sharing my wish otherwise it won't come true. Peace. Prompt 2 by Kadtie: You have never seen your own face. Only reflections and photos. Prompt 3 by Lisa: The way you say my name. Prompt 4 by Sean: this skip of VHS tapes found on his street. 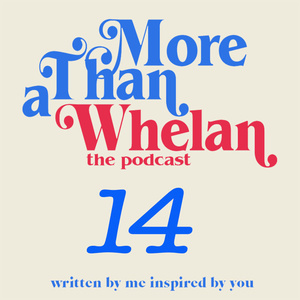 Sean closes the show with a World of Whelan update. Sean will be performing on November 1st at the Alex Theatre in St Kilda for Cafe Philosophique De La Mort.